Pin the Entredeux together at the neck so your daygown will be even as you mark the buttonholes. Read all of todays Lesson before beginning! We are working on the pattern Embroidered Raglan Daygowns. We will be stitching the hem and sewing on the buttons. The hem allowance is 3". Read your pattern instructions about the Hem on View 1, Step 6. 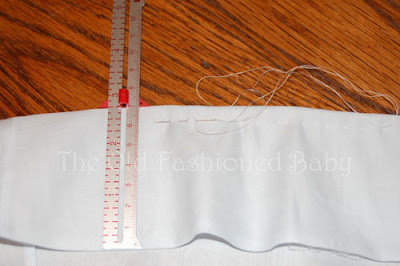 One way to mark the hem, is to measure up 3" and mark a line where you will turn up the hem. When basting a hem, use long stitches and remove them when garment is hemmed. 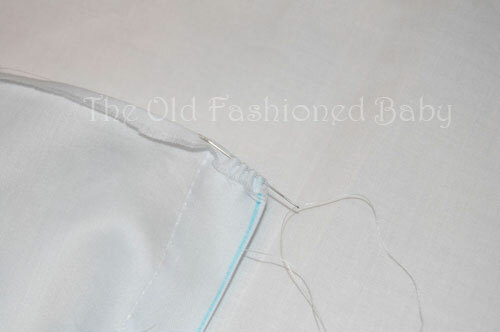 Another way to mark the hem, is to use a measure and pin or baste the hem at the lower edge. Basting the hem in place at the lower edge is a good idea. Then you can hem it with out worrying about the hem being the right depth, or about being stuck by all the pins that would be needed to hold it in place. Turn up the lower edge of the hem 1/8" to 1/4". Press. Then stitch a tiny Running Stitch along the fold of the hem. To make stitching easier, stitch to the side seam and tie off. Stitch the front and tie off. Then stitch the last back section and tie off. You can pull up the thread of each section to ease in the fabric. Because this gown is A-line. The lowest part of the hem is wider than the area it will be stitched to (when turned up). This is why you must ease the fabric evenly to fit. There is a method to reduce the hem bulk , thus reducing the amount of easing necessary but it must be done at the time of stitching the side seams. I don't use it very often but perhaps it will be a later post. 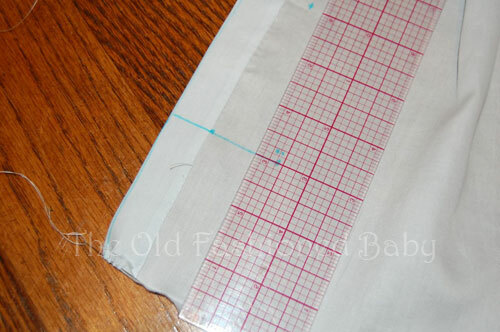 If you have the pattern Baby Layette, it is explained with the hemming instructions. For a complete overview of todays techniques please go to the Hem and Buttons post. Read the entire post. This is the last lesson in this Sew-Along. I have enjoyed sewing with you very much. Next Friday, I plan to post some of your Daygowns from this Lesson. So make me happy by sending me photos of your daygown! It will encourage me to have another Sew-Along!! Send to jbaumeister@cox.net. I need them by Thursday. Pictures of just a part (your favorite part) of the Daygown are welcome. If you are a late comer, you can follow this Sew-Along by yourself and make a Daygown. Question for this Lesson: What did you like best about this Sew-Along? Will you send me a picture of your Daygown? Now - Today I have something special for you! 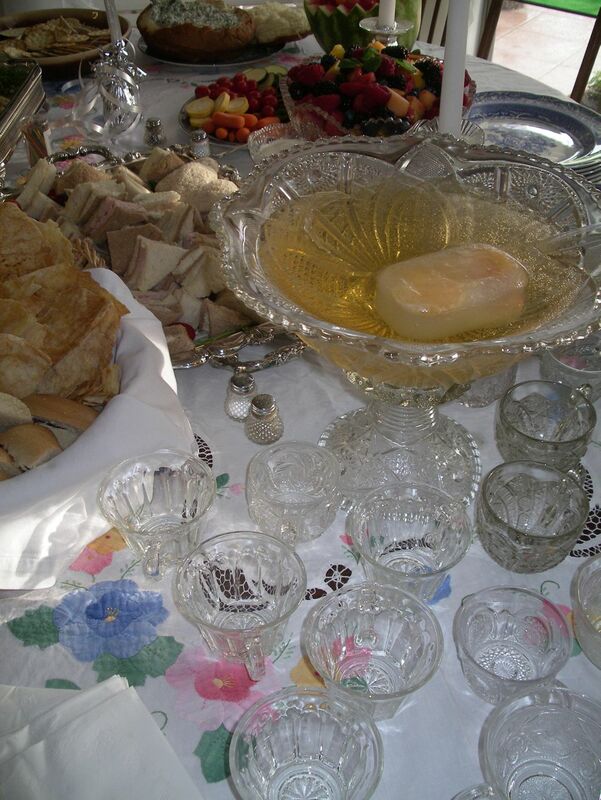 My Great Grandmothers Fruit Compote bowl. We are going to have a wonderful lunch together. You can wear your PJ's to this Luncheon! I found this antique two piece Punch Bowl in Norfolk several years ago. And Yummy punch to drink from antique punch cups!! Chill everything and add a large block of frozen Grape Juice or Ginger Ale. Mix just before serving. I have had so much fun in the sew along. THANK YOU so much for posting it!! My favorite part was learning some new techniques, especially handmade buttonholes and the old fashioned method of attaching entredeux. I will be sending you a photo of my completed daygown and matching bonnet. I loved sewing everything by hand. I've never done this before. I also stitched a gown on the machine at the same time I was doing this by hand. The one done by hand actually hangs prettier. I will definitely add some totally hand-made items to my grandbaby hope chest. Thank you so much for this sew along. It's been great fun. And lunch looks delicious!!! My favorite part of the Sew Along was realizing how much I enjoy sewing by hand and that I can find the time to stitch by hand, even with 5 children. I will definitely be sending you pictures; hopefully tomorrow! I am excited to try it on my little boy and love how it turned out! Thank you so much for sharing your talent with us!! 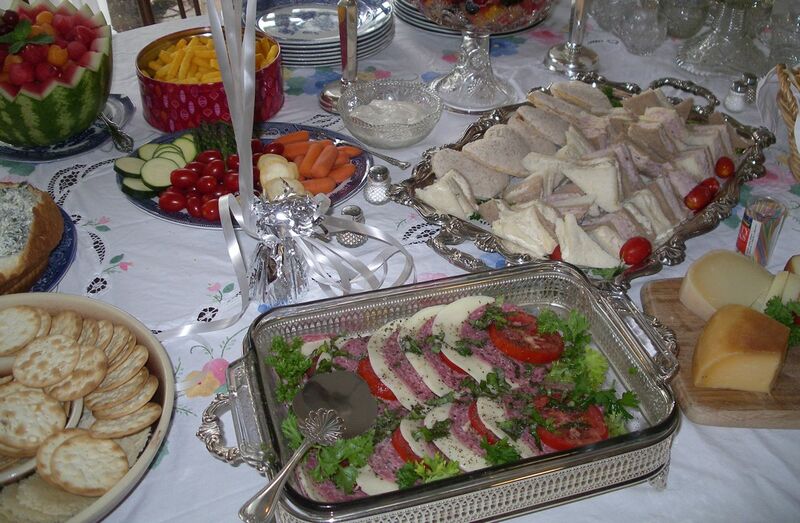 I wish I could visit you today and share your delicious lunch, too! My favorite part was just sewing your wonderful pattern! The pattern always fits well and is just precious. My favorite part of the sew-along was stitching the lace by hand. It feels softer and looks much prettier than lace stitched by machine. I will send you a photo when I finish. Thanks so much for the sew-along. Oh no, I'm still not quite done with the embroidery! Almost there, though. I'll have it all done soon. My favorite part was working with satin batiste for the first time and doing the embroidery, which is a bigger pattern than anything I've put on a baby dress so far. I'll send a photo when I'm done! Thanks for so much fun! I have loved this sew along!!!!! The tea, desserts and now a luncheon - you have out done yourself!!!! I have loved every step of the sew along. Following the order you constructed the gown and sewing by hand under your guidance has been wonderful and I can't say which part of the construction the best -have enjoyed all. I will post a picture once completed My gown will have a little travel history, Louisiana, Alabama and next week Colorado. Thank you so much for taking your time to do this and I do hope you will do another. I've loved sewing the whole gown, but I'm still partial to the embroidery. Learning some new hand-stitching techniques has inspired me to purchase a book on French Handsewing. Can you recommend a good one? Usually I give away all my baby/kids clothes after finishing them, but this gown will go in my treasure box. I will definitely be sending pics of my gown to share. I'm almost finished crocheting the lace. Thanks so much for having the sew-a-long. I've loved the whole process! And also everone's answers. I feel as if I received new friends. Happy stitching to everyone and I hope we can all do this again sometime! My favorite part was learning to sew a gown by hand. I plan on doing another when I finish this one. It's amazingly relaxing. I'm still working on the embroidery. Life has become extremely busy all of a sudden. Thank you for sharing your knowledge and time with us. Hope you will have another lesson soon. What did you like best about this Sew-Along? There are so many things but to pick one I'll pick learning how to use entredeux. Will you send me a picture of your Daygown? Yes, God willing I'll send you a picture by mid-week. I would like to give you my thanks for all the effort you put into this amazing sew-a-long. It has touched my life in a positive manner. I hope to make many more gowns in the near future by hand. Thank you again so much! I've really enjoyed the Sew-Along and think your luncheon looks yummy! I love the way your patterns always fit and they your instructions are the best! I am planning to send you a photo of the completed daygown, hopefully today or tomorrow. Baby is scheduled to arrive Wednesday! Thanks again! I enjoyed the entire sew-along but learning to do buttonholes by hand and doing the embroidery were my favorite parts. I'm really looking forward to your next sew-along! I should be done in time to send you a picture Thursday. The best part of sending a photo is that no one can look too closely and find the mistakes! This was wonderful; thank you so much for sharing with us all. My favorite part? The tea ;-) Actually the best part was learning to sew a garment entirely by hand-especially the buttonholes! This day gown has been on two camping trips (not too easy to take a machine in a pop-up) It was so nice to have a sewing project with me. Little Hannah (my dgd)is due to arrive in the next couple of weeks-I can't wait to see it on her. I will be sending a photo. I am looking forward to the next sew-along. I forgot I have a question. Are there any lessons on how to attach lace to fabric by hand? I want to make a slip and bonnet to go with this dress and I want to do them by hand as well. Thank you! I have really enjoyed the Sew-Along and would like to do other projects in a similar manner. Of course, I am behind and not finished! I am still embroidering! However, I will finish. Doing buttonholes by hand was my first favorite new lesson and is now a new skill. My second favorite thing is being able to go back to the lessons online, review technique descriptions and pictures. One really can sew at your own pace! This is a really big plus in 2010!!! The internet is a wonderful thing for the sewing world!! I don't know about everyone else but I always have numerous projects going at the same time that require different type of sewing--machine sewing, geometric smocking that can be done while watching TV, picture smocking that needs quiet concentration, delicate hand embroidery that works better when the house is quiet, or assorted hand sewing while listening to a book on tape or having a conversation. I absolutely love being able to refer back to my instructions online, view related tutorials, and then work at my own pace!! Jeannie, thanks so much and I'll participate in your next Sew-Along! I'll send pictures when I finish. This has been a wonderful experience ~ from receiving the supplies, anticipating each Friday's lesson, to finishing the last stitch. I discovered new techniques and came to love embroidery even more after this. That was my favorite part! I'm still a machine sewer at heart, but knowing how to do hand-sewing techniques is good, too. I really appreciated having small bits of work to do every week. When life was hectic one week, it was easy to catch up. Thank goodness you served such lovely teas ~ you inspired me to bake my family a few extra treats, too! I finished sewing on the last two buttons this morning. My favorite part of the sew along was realizing that my hand sewn buttonholes are finally starting to feel routine instead of like an ordeal. These were the easiest and the prettiest I've ever stitched! (I couldn't send pictures by the Thursday deadline, but I sent some along this afternoon.) Thanks for everything! Jeannie, I wanted you to know I finally finished this daygown! And in spite of my daughter now being four months old, it actually fits! I loved learning how to do the embroidery. And, believe it or not, the buttonholes! I'm doing all my buttonholes by hand now, as I don't like how my machine does them. Thanks so much for doing the lessons!